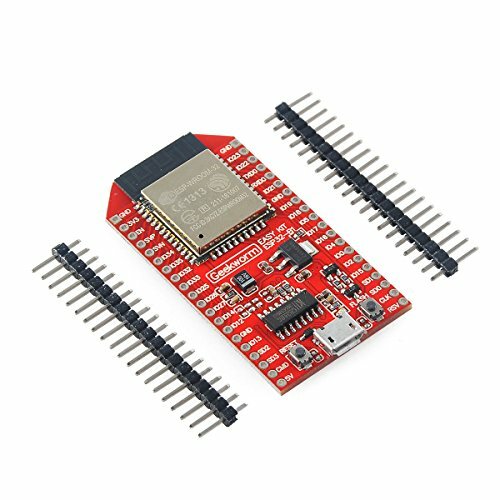 Geekworm ESP32-DevKitC is a low-footprint, minimal system development board which is powered by our latest ESP-WROOM-32 module and can be easily adjusted to a breadboard. Built around the ESP-WROOM-32, this minimal system development board achieves optimal performance with its rich peripheral set, Wi-Fi and Bluetooth radio solutions, which are offered by our latest SoC, the ESP32. The limit is your imagination! Get right into application design and development without worrying about RF performance and antenna design. The ESP32-DevKitC has your basic system requirements already covered. Just plug in the USB cable and you're good to go! The ESP32-DevKit contains the entire basic support circuitry for the ESP-WROOM-32, including the USB-UART bridge(CH340), reset- and boot-mode buttons, LDO regulator and a micro-USB connector. All pin export GPIO is available to the developer. The ESP32-DevKitC pinout is optimized for prototyping on a breadboard. The on-board LDO output is led out for powering additional off-board electronics. Peripheral outputs are grouped together for hassle-free prototyping. low-footprint, minimal system development board which is powered by our latest ESP-WROOM-32 module and can be easily adjusted to a breadboard.